On the PILE OF WEAPONS from Barclay, Beaufort, Burley, and Callow, now in a heap outside the captain’s cabin. 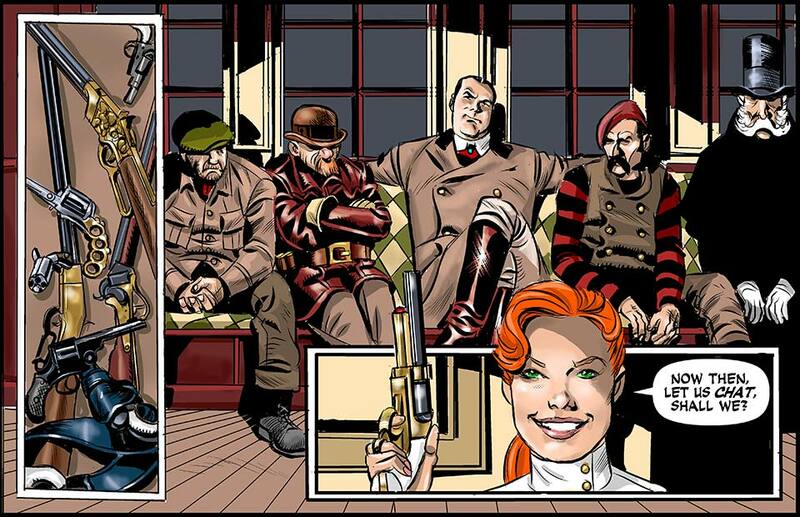 SABRE standing at the map table, the LANTERN’S glow, her PISTOL pointed at PAYNE, seated on the COUCH. BARCLAY, BEAUFORT, BURLEY and CALLOW all filing in. On PAYNE and the rest, seated on the couch. None of them are pleased, but PAYNE is quietly fuming. This is not what they expected. On SABRE. She’s cocked her elbow, raising her point of aim upwards. A sly smile. The MAP CASE in her other hand. 1. SABRE:	Now then, let us chat, shall we? Shoulda sent your goons in first, like a smart villain! Oh, and tell them to wing her in the arms and legs before she starts talking. Payne’s only agreeing to this because, so far as I know, he’s still got his sniper up in the crow’s nest. So far as I know… and so far as he knows! This is looking like the gang that couldn’t shoot straight. I love how they look like they been called to the principals office. Now I’m imagining them as characters from the Breakfast Club. It’s not very pretty. A much higher quality bunch of firearms than I would have expected from a bunch like this – except for the Apache, which fits right in. Greg and Rick: well played!